Featuring Patrick Stump, Pete Wentz, Joe Trohman and Andy Hurley. Distributed by Eagle Vision. 80 minutes. Not Rated. 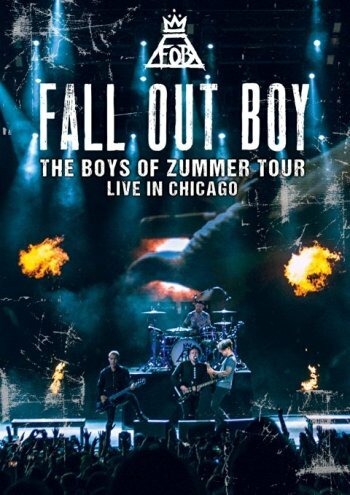 Despite the oddball title (FOB are nothing without oddball titles), The Boys of Zummer is actually a good refresher course as to what a smart, hard-hitting band Fall Out Boy really is. Smartly, they kick things off by kicking out the jams with their breakthrough single � still arguably their best moment � "Sugar, We're Going Down." Smart, tuneful, raging and rocking like a mother, this song sets up an hour and a half of going down swinging. This leads into a lean and mean runthrough of hits and favorite album tracks, from the nuevo-rock atmospherics of "My Songs Know What You Did in the Dark" to the sing-along thud of "This Ain't a Scene, It's an Arms Race." The group shows off its pop chops on titles like "Thanks For the Mmrs" (Memories) and the stunning "Dance, Dance." Lesser known tracks like "The Phoenix" and "Thriller" (no, not the Michael Jackson song) show off the band's deep back catalog. It's not hard to notice that many of their best, tightest songs came from their first two albums. However, it is gratifying how well the whole set holds together. Fall Out Boy may be taking a winding road in their career, but they still can put on one hell of a show. Copyright �2016 PopEntertainment.com. All rights reserved. Posted: December 1, 2016.